Want to see the sunrise the most beautiful scenery in Indonesia? Come to Mount Bromo, Probolinggo, East Java. There is a thrill to see the sun slowly emerged from behind the mountain and the cloud was under our eyes. Like a float on the mountain. Mount Bromo (from Sanskrit: Brahma, one of the main Hindu Gods), the volcano is still active and best known as a tourist attraction in East Java. As a tourist attraction, Mount Bromo to be attractive because of its status as a still active volcano. 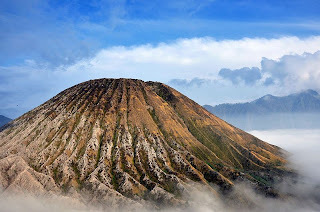 Bromo has a height of 2392 meters above sea level is located in four regions, namely Probolinggo, Pasuruan, Lumajang, and the District of Malang. Mount Bromo mesh body shape between the valleys and canyons with a caldera or a sea of ​​sand covering approximately 10 square kilometers. Mount Bromo has a crater with a diameter of ± 800 meters (north-south) and ± 600 meters (east-west). While the danger area of a circle with a radius of 4 km from the center of the crater of Bromo. 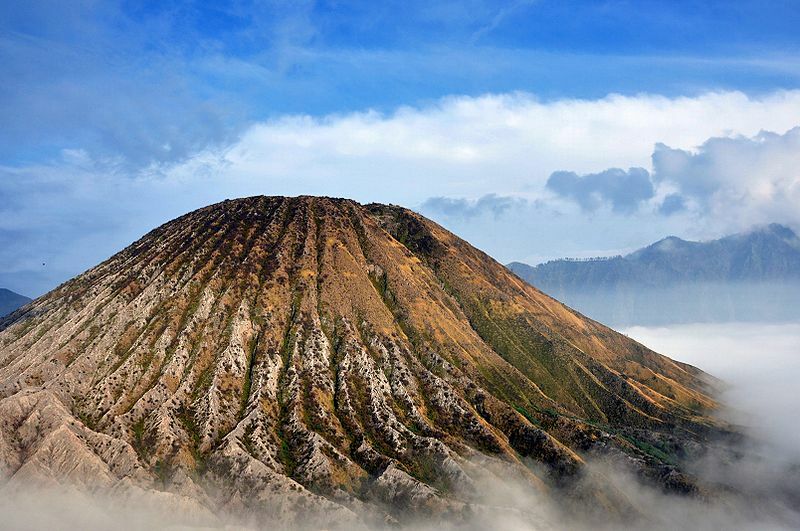 From Jakarta to Mount Bromo can be reached in three ways. Through a direct air flight ticket from Jakarta to Surabaya. Almost all the national airline of open lines of Jakarta-Surabaya.Until there is an option at Juanda Airport Damri bus that took us to the bus terminal Bungurasih Surabaya. Choose a bus or Banyuwangi Jember majors. To the bus conductor, say that you want to go down in Probolinggo.Until Probolinggo Terminal, you can go up to the department of transportation district Ngadisari village, it costs about 25 thousand dollars. But do not be surprised. Transport passengers waited until the village is full, then later he was leaving. So for a long time to wait for the car kind of old colt to go.Through the railway line, many options for you, ranging from executive class to economy. You can take the train Angrek Agro executive or non-economic train AC New Style to Surabaya.Gubeng from Railway Station, Surabaya, you can ride the Railway Department of the East Pearl Surabaya-Banyuwangi which departs at 09.00 am each day. You buy a ticket to Probolinggo stations only. Probolinggo Station can ride the public transportation to the bus terminal to replace the shuttles Probolinggo village to the district Ngadisari, last town before the Mount Bromo.If executives want to take a bus directly to Probolinggo, there are several options in executive bus Bus Terminal Jakarta majoring Lebakbulus Jember or Banyuwangi. You simply buy a ticket from Jakarta to Probolinggo majors only.In District Ngadisari many choices where to stay. Could be in hotels or the homes of people sharing a room is only 100 to 200 thousand dollars only. Affairs of the stomach not to worry. There are many food stalls that sell drinks and hot meals to reduce the cold air of Mount Bromo.To see the sun rise to Mount Bromo located at Penanjakan. You need to rent a jeep hardtop car to take you across the sea of ​​sand. Rents of about 300 to 400 thousand dollars per car.For this you can rent a car with a few tourists venture. One car enough for seven people. You should've ordered this jeep at night. Owner of the hotel at 03.00 am will wake you up to go see the sunrise. Jeep drivers here are very good at driving his car on a dark sea of ​​sand.Do not forget to bring a jacket, scarf, gloves, hats and earmuffs. Because in addition to the cold, high winds also make you cold. Very lucky if you come not in a state of cloudy weather so freely to see the sunrise.At about 4:45 pm the sun will rise slowly. About 30 minutes you'll be amazed at the beauty of the sunrise until the sun bright and the top of Mount Bromo berendang seen adjacent to Mount Batok.Do not be surprised a lot of visitors who applauded when the sun comes up slowly because of its beauty has its own sensation. We would feel to be on the cloud below to see the mist dancing over Mount Bromo. The peak of Mount Semeru is also visible in the distance back to Mount Bromo.Once satisfied with the photographs in Penanjakan, you can directly into the crater of Mount Bromo. Rented jeep will take you to the last stop near the temple at the foot of Mount Bromo.To rise to the top of the crater of Mount Bromo you can take the stairs up to the peak. If do not want to achieve, Anad can rent a horse at a cost of 100 thousand dollars. You'll ride a horse with a guided horse owners so you can be secure in the saddle riding his horse ran away without worry.From the summit of Mount Bromo crater you'll see first hand a bit smelly sulfur. The beauty of the landscape under a sea of ​​sand and graceful Hindu temple in the distance the foot of the mountain.The horses are waiting for visitors renting park also adds to the beauty of the scenery. On the side of Mount Bromo, Mount Batok can also be seen that looks like a layered cake shape for the shape of the mountain like a giant multi-layered.After being photographed at the summit of Mount Bromo fun you can get ready to fall from peak to Ngadiari. Of course back in a rented jeep up the faithful waiting for you to return to the lodge. Do not forget to deal with the price of a rented jeep driver you have to detail, from the shuttle returned to the inn to inn. Do not forget to stop occasionally for photographs.